The elusive quality of time has been the focus of my artwork for the past 25 years. Through photography and cloth, I have explored the mystery of waves in the ocean, flowers blooming and fading, momentary shadows, and weathered stones. 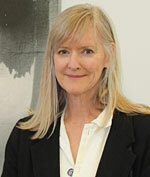 I have painted, printed, dyed, layered and stitched cloth for many years. 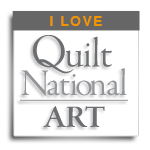 I only began quilting the entire surface of the cloth about five years ago. 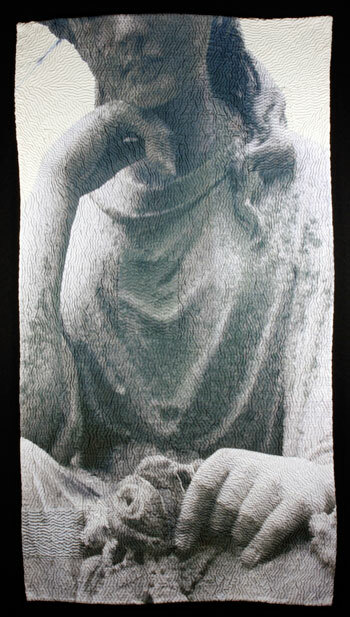 In my current body of work, hand quilted textile photographs; I explore images of cloth and figures carved in stone from historic sites and cemeteries. I have lived all my life in St. Louis, Missouri. Many of the cemeteries in this city are historical gems with statues and monuments dedicated to some of the most famous business and community leaders of the past. The names of those honored, etched into the stones, are recognized as the names of streets, parks, businesses and landmarks of this community. Enigma with a Flower, currently traveling with Quilt National 2013, is a photograph of a statue from the Mount Sinai cemetery in St. Louis. I am drawn to these sculptures that stand as guardians of human history and photograph details and elements to incorporate into my quilts, imbuing each statue with mysterious significance. I am interested in the intersection of domestic ritual and contemporary technology and use repurposed flour-sack cloth dishtowels as the vehicle for my images, printing the photographs onto the cotton fabric with a wide format ink-jet printer. Detailed sections of the image are created and layered, collaged and hand stitched onto the cloth, referencing earlier domestic practices of mending and repair, reuse and repurposing. The delicate, repetitive hand quilting across the surface creates shadows and textures and alludes to the marking of time. Each piece quietly takes its own shape beyond the original square format as the threads are gently drawn and pulled through the cloth.